This perennial will grow 4-6' tall and spread 2' wide. It has silver-gray, narrow and 2' long leaves. During spring, a tall vertical spike shoots up from the foliage containing hundreds of dark pink flowers. Birds and bees love the flowers. If flowers are left on plant, seeds will propagate the plant. Echium prefers full sun and well draining soil. Tolerates coastal conditions. This plant has low watering needs once it's established. Little or no summer irrigation needed. This unusual looking succulent slowly forms a thick upright trunk, reaching 6' tall. At the top of the trunk is long slender grass-like leaves, cascading down like water from a fountain. Foliage can reach 3'-5' tall and 3' wide. Once in a blue moon, white flowers appear above the foliage in spring with lots of nectar. Australian Grass Tree needs full sun, well draining, sandy, dry soil. It is drought tolerant once it's established. Aeonium arboreum 'Zwartkop' is a succulent perennial that is used for accenting effect. Aeonium arboreum grows 3' tall and wide. Each branch has a 6"-8 " wide rosette of dark green, fleshy leaves.The flowers are yellow in clusters. This large tree will grow to about 80' tall and 60' wide with glossy green, stiff leaves and produces giant cone-fruit. This Yucca has blue leaves, a tall narrow trunk, and a spectacular summer display of cream white flowers. It is one of the most attractive tree Yuccas. It slowly forms a trunk to 10' tall. The young are usually unbranched; the older have a few branches. Narrow blue leaves can grow up to 2' long and .5" wide with a sharp term spine. 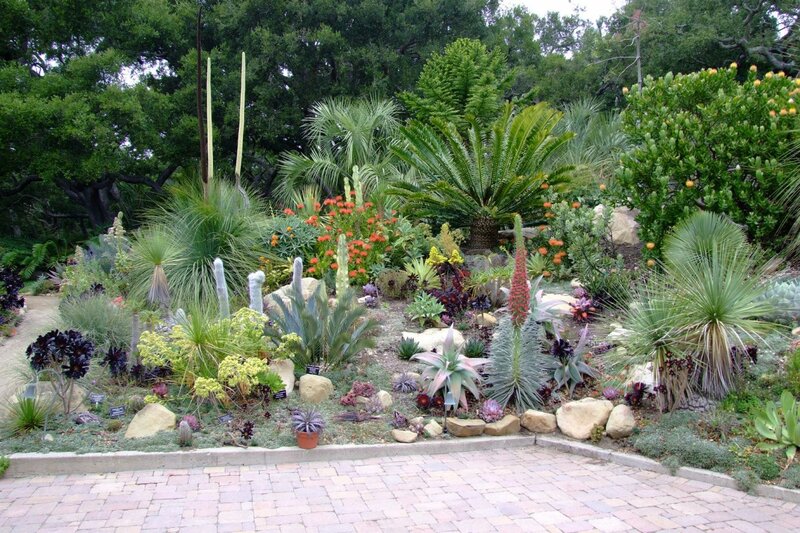 This Yucca prefers full sun or very light shade and rocky, well drained soil. It is susceptible to grubs.Old leaves persist. Sago palm resembles small palms; it is evergreen. It can slowly grow to 10' tall so consider the space around it when planting it. It is used for a tropical effect and also looks great in planters. In the low desert, light shade and additional moisture are best. It does best with well draining soil. Side sprouts can form multi-trunked individuals. Apply fertilizer at leaf expansion. This plant has few pests. The leaves and seeds are poisonous to animals. Sago palm is also used for bonsai. Established plants need little water and care. This cactus will slowly grow 20-50' tall. It has long white hairs and yellow spines. Only plants over 15' tall will bloom; it produces rose colored flowers that bloom at night. It does best in full sun and dry, rocky, well draining soil. It will need afternoon shade in low desert areas. Water occasionally in summer but it will need no watering in winter.